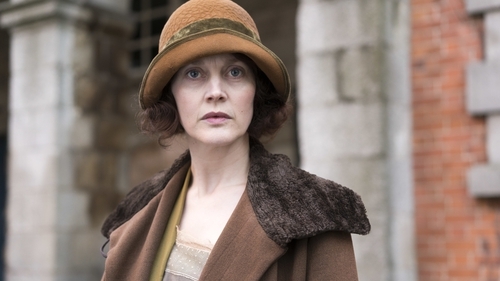 RTE’s new Resistance drama is set in Dublin during 1920 and uses Michael Collins’ intelligence war as its backdrop. Perhaps the most compelling subplot concerns a conflicted single-mother and IRA spy, Ursula Sweeney, played by Simone Kirby. That character is based on the real-life IRA agent, Josephine McCoy, whose story has been relocated from Cork to Dublin and reshaped by the writers, yet it retains its inherent drama, even a century later. The daughter of a retired RIC head constable, she was raised in Cork City and trained as a secretary. In 1910, she moved to Wales and married a local man, Coleridge Brown (originally named Marchment) in 1913. The same year, she gave birth to their son Reggie, with a second son, Gerald, arriving in 1915. McCoy stated her husband’s family was "hostile to Catholics…neither did they want the children to be brought up in the faith." Tensions increased when Josephine moved into with her in-laws after Coleridge enlisted in the British army for war service in Flanders. She was not happy with the new living arrangement and ultimately returned to Cork. She took her infant son Gerald, but left the elder boy Reggie in the temporary care of her in-laws. After Coleridge was killed in late 1917, his family refused requests to return Reggie to Ireland, forcing Josephine to sue for custody. At the court hearing, the family produced a letter from Coleridge, written without his wife’s knowledge, stating that he wished his sons to be raised in the Protestant faith by his sisters in the event of his death. The judge granted them permanent guardianship of Reggie, in a ruling that was likely influenced by a religious and gender bias against a single Catholic mother. Josephine McCoy returned to Cork and found a job in Victoria Barracks, the British army’s Sixth Division headquarters. Bright and competent, she was quickly promoted to head of civilian clerks and typists, managing a staff of 25 in the headquarters, which oversaw troops across Munster. McCoy lacked the financial resources to continue her custody battle so she sought alternative recourse. In September 1919, she described her plight to an outspoken republican priest, Fr Dominic O’Connor, who put her in touch with Florrie O’Donoghue, the head of IRA intelligence in Cork. She began passing O’Donoghue secret army reports, with the understanding that the IRA would reunite her with her son. While British staff officers recognised a leak in their headquarters, they never uncovered the young war widow conspiring against them. McCoy worked inside the barracks without any internal IRA assistance and carefully took notes and made copies of sensitive documents that revealed military operations and government planning, which she smuggled to republican agents. The IRA later claimed her assistance resulted in the deaths of three British Army officers and six civilians accused of assisting the Crown forces. McCoy appears to have been careful and cool under pressure. While British staff officers recognised a leak in their headquarters and dismissed some of her innocent co-workers, they never uncovered the young war widow conspiring against them. In December 1920, Florrie O’Donoghue travelled to Wales to kidnap Josephine's seven-year old son. O'Donoghue and two armed IRA volunteers invaded the in-laws’ home, drove Reggie to a safe-house in Manchester, and eventually had him smuggled back to Cork. Reggie was subsequently hidden in different safe houses near Cork, where his mother was able to visit him. Unlike the Resistance series, there is no suggestion that the IRA tried to control Josephine’s access to her son. While Josephine was suspected in the kidnapping, she was fortuitous in its timing, as it occurred just days before the burning of Cork by Crown forces and the imposition of martial law, which distracted her army employers in Victoria Barracks. During the fallout from Reggie’s abduction, she assumed the role of victim and sought guidance from her military superiors. A seemingly vulnerable war widow like Josephine McCoy must have stirred the army officers’ emotions to such a degree that it overcame their common sense. During this charged period, Josephine and the IRA intelligence officer Florrie O’Donoghue began a romance, which resulted in their secret marriage in April 1921. Josephine continued working at Victoria Barracks until the July 1921 Truce, seemingly leaving her employers none the wiser. Florrie O’Donoghue opposed the Anglo-Irish Treaty and served as Adjutant-General for the anti-Treaty IRA until the outbreak of the Civil War. He refused to take part and set up the Neutral IRA organisation to try to find a peace settlement. He later became a noted historian of the revolutionary period. The couple lived in Cork and raised six children: Reggie and Gerald by the first marriage (both adopted by O’Donoghue) and four additional children. Reggie attended University College Cork and became a doctor and later practiced in England. Josephine’s role as an IRA intelligence agent was known only generally in Cork, except to a select circle of former comrades from the independence struggle. Shortly before their deaths (Josephine in 1966 and Florrie in 1967), the couple penned a joint memoir that explained the strange events that led to their 45-year marriage. That story is just as fascinating as the fictional one.